There are many essential pieces of camping equipment that we all take on every camping trip, however, one piece of camping equipment that often gets overlooked is the humble camping chair. There are those that prefer to rough it when camping by sitting on a log or the ground. Personally, I prefer the comfort that a good quality chair for camping offers over the hard ground any day of the week, especially when sitting round the campfire with a beer and some dinner. In our Ultimate Guide to the best camping chair in Australia we will be bringing you the top rated camping chairs as well as sharing all the information you need to know before buying a camping chair. Before buying a camping chair there are a few factors worth considering first, especially if you are to choose the one that is best suited to your needs. The maximum weight capacity is an important purchasing consideration and something that you should pay close attention to when buying. You will find that most camping chairs come with either a steel or aluminium frame with each having their own advantages and disadvantages. Generally speaking a steel frame is stronger and can support a higher weight limit than a camping chair with an aluminium frame. On the flipside steel is heavier than aluminium and if you have a long trek before you reach your camping spot a lighter aluminium framed camping chair might be the better option. When deciding upon a certain model be sure to check the product specifications for the maximum weight capacity. Typically a good camping chair will have a maximum user weight of 200kg. For many comfort is the number one priority when choosing a camping chair and rightly so. After a long day of camping activities a comfortable chair for the evening around the campfire is a must have. The main things to look for when choosing a comfortable chair for camping are the dimensions and the padding. If you are of a bigger than average build then I would recommend a moon camping chair as these are wider than your traditional chair and very well padded offering ultimate comfort. When buying a camping chair you will find that the more expensive options come with thicker padding and some even have a padded headrest. Other things to look out for when choosing a chair for camping are the addition of things such as pockets and a cooler bag. Many of the best camping chairs will come with an insulated cooler bag for storing your drinks (beer). The insulated cooler bag helps to keep your drinks colder for longer, another must have for the serious camper. Now that you are prepared with the information to help you choose the best quality camping chairs for your needs, its time to take a look at the top camping chairs in Australia in 2019. For most of us camping is something that we do with the family. Consequently, there will be many of you out there that are looking to buy more than one camping chair. If this is you then you may well be interested in this deal we have from Oztrail. The model featured is the very popular Oztrail Big Boy Folding Camping Chair, which ranks high in many of the best camping chair reviews. 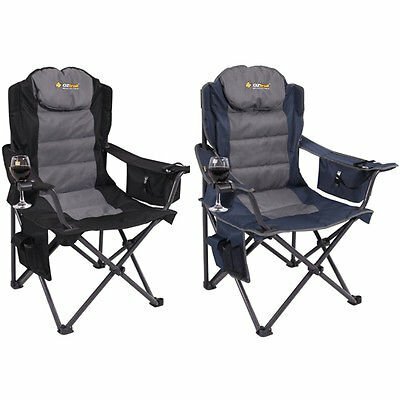 This is a combo deal with which you get two of the best camping chairs in Australia for a very good price. As you can see from the image these are thickly padded and offer the ultimate in picnic and camping comfort. With a high-tensile steel frame and a maximum weight capacity of 200 Kg they are highly durable and built to last. Features include wide arms for added comfort, a padded backrest, a large drink holder as well as an insulated storage pocket. 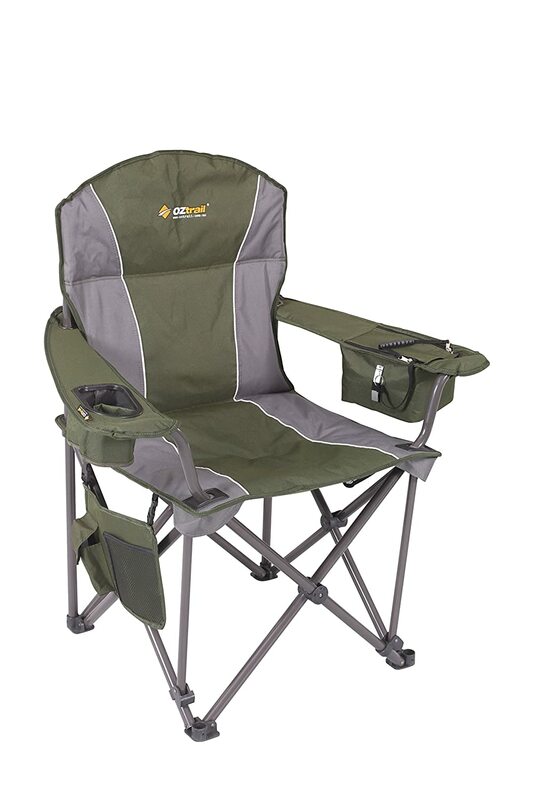 Easy to set up and offering comfort and functionality in abundance, the Oztrail Big Boy comes recommended as the number one camping chair in Australia in 2019. 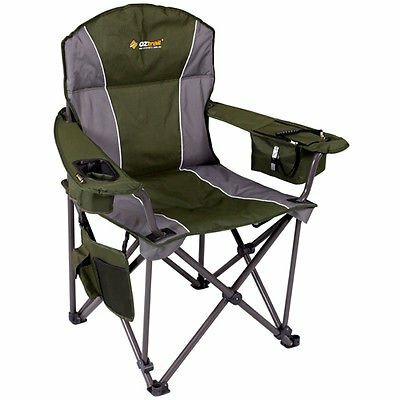 If you are looking to only buy the one camping chair then the new Oztrail Titan is our top recommendation. Similar to the previous model this is a very sturdy chair and with a weight capacity of 200kg it should be suitable for all, except for the odd American. The frame is made from heavy-duty steel and the material is 600D fully padded polyester. Weighing in at only 4.9kg this chair is lightweight but remains sturdy and durable. The wide armed design offers maximum comfort and once the chair is folded it is relatively compact compared to other models. Our favourite feature is the insulated drink holder with a cover. This helps to keep your drink cool in the summer. Offering a good mix of quality and affordability the Oztrail Titan will last for many years of camping. Due to its lightweight design it features in many camping chair reviews as the best lightweight camping chair. Regular campers will already know that Coleman make some of the very best camping gear. 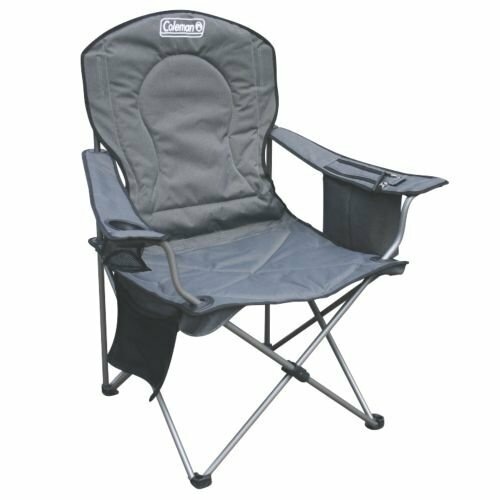 The Coleman Quad Deluxe Cooler Chair is by no means the very best folding camping chair, but it does represent extremely good value for money. At 4kg, it is lightweight and folds up without any hassle. In addition the material used is durable 6D polyester fabric. Overall the chair itself is very sturdy and nicely padded for comfort. The outstanding feature for many of us will be the four can capacity drink holder and side accessory pockets. Once fully loaded you won’t have to leave your comfy camping chair for a good while. 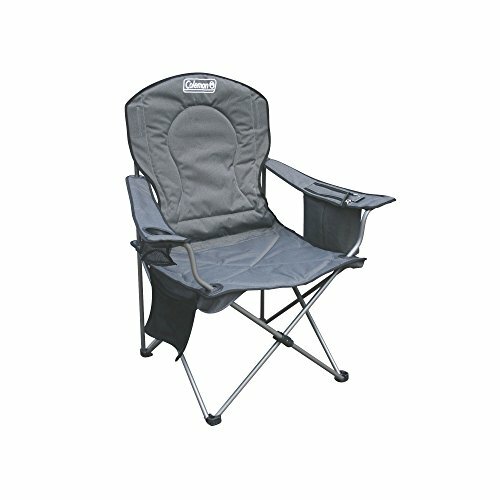 If you aren’t looking to spend to much on a new camping chair then the Coleman Deluxe is a good choice. For under $50 you get a durable and functional chair from a brand with an excellent reputation for quality. In my opinion a camping chair is an essential piece of kit that goes a long way in making any trip a more enjoyable experience. Hopefully with the help of our short buyers guide and best camping chair reviews you managed to find what you was looking for. Find out all you need to know about buying a tent for the family with the help of our ultimate guide and reviews of the top 10 family tents in Australia.